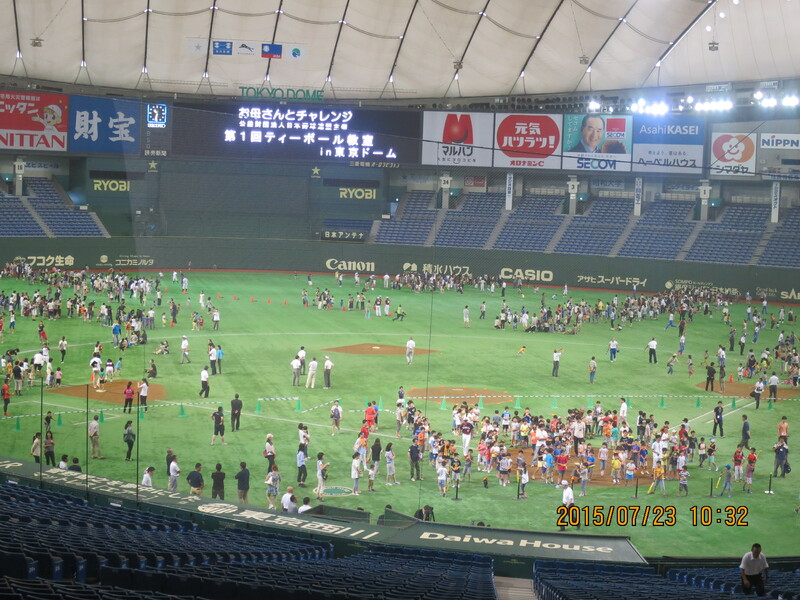 The Japan Amateur Baseball Association (JABA), an affiliate of Baseball Federation of Japan, held the event at Tokyo Dome on July 23, 2015, before the scheduled games of Day 6 of 86th National Intercity Baseball Championship. Professor Tadashi Yoshimura (69) of Waseda University, an inductee into the North American Fastpitch Association (NAFA) Hall of Fame for his long and ongoing contribution to develop and promote teeball in Japan and Asia, backed by his storied career in softball, was a driving force in delivering the program. 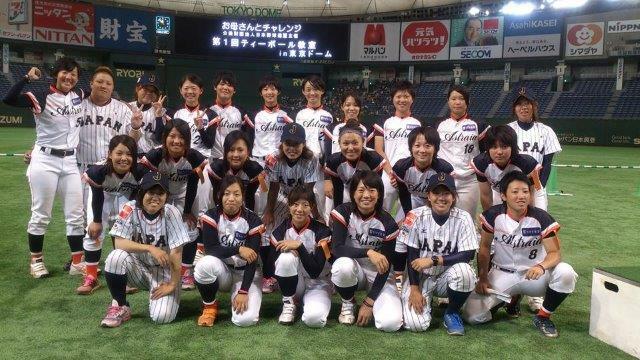 Women players from National Baseball Team, Madonna Japan, and “Astraia” Professional Team acted as coaches and help moms and kids to have fun. Teeball is an entry sport to baseball and softball for junior players, generally four to eight years old. The ball is placed on an adjustable tee atop the home plate at a suitable height for the batter to strike. The elimination of pitching allows children to participate without the fear of being hit by a pitched ball. Teeball develops the primary baseball skills of hitting, running, fielding and throwing. The players gain an understanding of the fundamental rules, which allows minimally competitive league play at all age levels. While the professional baseball in the USA and Asia enjoy increased attendance of fans in recent years, baseball community professionals and amateurs alike is aware of the needs to increase the youth interest in baseball. In Japan, the drag on the birth rate, and conservative one-sport environment call for major initiatives such as the Teeball class on July 23 for the health of the sport in the long run. According to an annual survey by the Japan High School Baseball Federation (JHBF) published on June 30, 2015, the total number of JHBF this year was 168,898, a small decline of 1,414 from last year’s highest since 1982 when the survey started. The number of member high schools, however, continues to decline for the last 10 years from the high of 4,253 in 2005. As is the case with MLB, Japanese baseball faces headwinds that have been years in the making and the forces that are outside its direct control even though the rate of decline may not be as alarming as elsewhere. A pervasive emphasis on performance over mere fun and exercise has driven many children to focus exclusively on one sport from an early age, making it harder for not only baseball but all the other popular sports to attract casual participants. According to a survey in the USA, the factors that drove their interest in sports, fans between the ages of 12 and 17 cited participation as a major factor more often than watching or attending the sport. That was particularly true among male fans in that age group, 70% of which cited “playing the sport” as a big factor in building their interest. Professor Yoshimura, along with a vast majority of the baseball community in Japan, also believes that “Playing the sport” is a big factor in building interest of young people.